One Billion Base Pairs Sequenced on the Space Station. 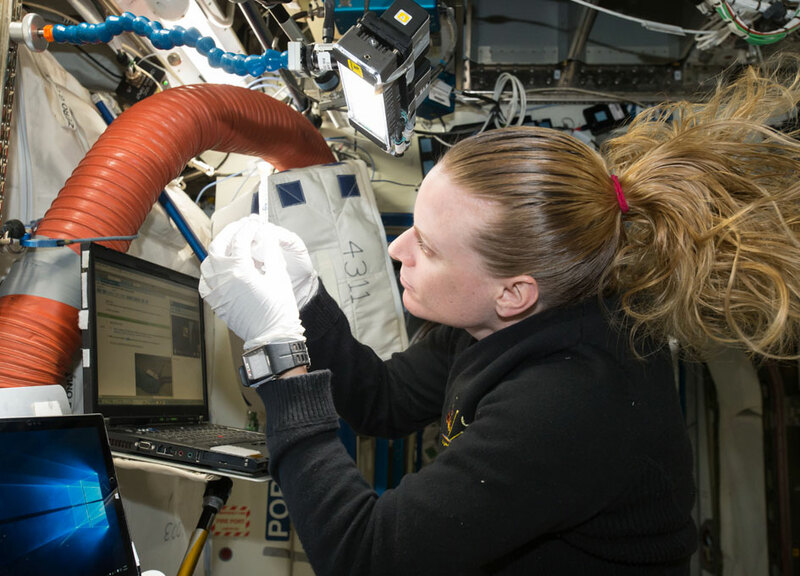 Aboard the International Space Station, NASA astronaut Kate Rubins checks a sample for air bubbles prior to loading it in the biomolecule sequencer. When Rubins' expedition began, zero base pairs of DNA had been sequenced in space. Within just a few weeks, she and the Biomolecule Sequencer team had sequenced their one billionth base of DNA on the orbiting laboratory. "I [have a] genomics background, [so] I get really excited about that kind of stuff," Rubins said in a downlink shortly after reaching the one billion base pairs sequenced goal. The Biomolecule Sequencer investigation seeks to demonstrate that DNA sequencing in microgravity is possible, and adds to the suite of genomics capabilities aboard the space station. With a way to sequence DNA in space, astronauts could diagnose an illness, or identify microbes growing in the International Space Station and determine whether or not they represent a health threat. A space-based DNA sequencer would be an important tool to help protect astronaut health during long duration missions on the journey to Mars, and future explorers could also potentially use the technology to identify DNA-based life forms beyond Earth.